Help the farm members finish missions, and collect Sky Dinner Napkin to trade them for amazing rewards! 1. Ta-Da! Welcome to “Dinner in the Sky” everyone. Oh good here comes Ellie with our guest of honor. Welcome back to the farm Old Macdonald! C’mon everyone find a seat! 2. Don’t forget to buckle up. Soon, our table and chairs will lift high into the sky! Then a gourmet chef will prepare a delicious meal for us while we admire a spectacular view. 3. Tonight; a choice of poultry or seafood grilled to perfection. Hang on tight guys; here we go, high into the sky. WOW! We’re almost as high as the clouds. So awesome! 4. Now that we’re as high as we can go, let the feast begin! Hey farmer, why d’you think Felicia keep staring at me like that? Maybe she’s really impressed by my party idea! 5. Although, it also seems she’s trying to tell me something as she pretends to eat…I get the feeling like I’ve forgotten something, something BIG...but what could it be? 6. OH NO Farmer! I can’t believe I forgot this! Old Macdonald’s recently developed a fear of heights. OH man! What was I thinking planning this dinner in the sky for him? 8. I forgot that Old Macdonald has recently developed a fear of heights; don’t worry though. I will get us down to the ground in no time and we can finish our dinner there. 10. …now that he’s been forced to face his fear head on he feels cured and he says he has ME to thank for it! Ok well then maybe I didn’t ruin everything after all farmer! 11. Awesome! I guess we can finish our dinner in the sky experience now. 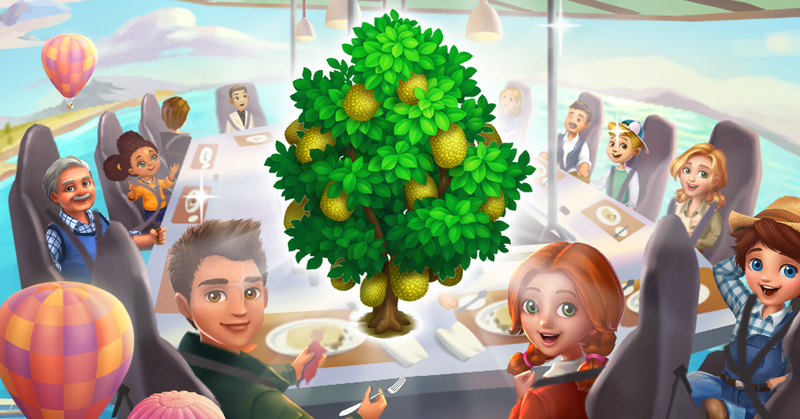 Eat up everyone…if you think dinner is good just wait until you try the desserts! 12. My personal favourite is Berries in a Nest but there are so many other ones to choose from; mmmm, like the the Creme Caramel topped with crystallized honey! 14. Felicia and I would now like to make a toast to Old Macdonald. We’re so happy to have him back home and can’t wait to hear about his time at the university. 15. We also can’t wait to tell him about all the cool new things happening around the farm too. So great to be all together again. Cheers to dear Old Macdonald, CLINK! Page generation time 0.0355 sek.